Tata Motors has launched the Harrier at a starting price of Rs. 12.69 lakh (ex-showroom, Mumbai). It is available in four variants - XE, XM, XT and XZ. 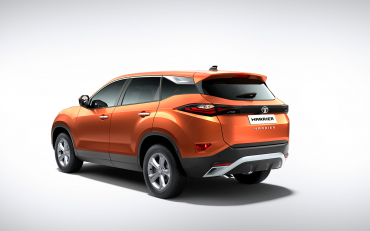 The Tata Harrier is based on the Optimal Modular Efficient Global Advanced (OMEGA) Architecture, which is derived from Land Rover's D8 platform. The Harrier measures 4,598 mm in length, 1,894 mm in width and 1,706 mm in height. It has a wheelbase of 2,741 mm and it offers a ground clearance of 205 mm. It has a 425-litre boot and the fuel tank capacity is 50 litres. 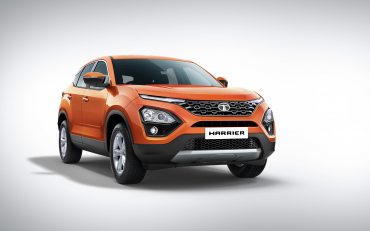 The Harrier's styling is based on Tata's Impact Design 2.0 design philosophy. It features slim LED DRLs and a dual-tone bumper with triangular pods that house the main headlamps and fog lamps. The bumper also has a silver scuff plate. The SUV has flared wheel arches and a sloping roof line with blacked out B and C pillars. At the rear, the Harrier comes with slim wraparound tail lights and a dual-tone bumper with silver trim. It has a roof spoiler and a black insert between the tail lights. The Harrier comes with dual-tone interiors with silver trim and a 7 / 8.8-inch touchscreen infotainment system that has Android Auto and Apple CarPlay connectivity and features like voice recognition and SMS readout. The SUV comes equipped with 6 / 9-speaker JBL audio system. It has a 3-spoke multi-function steering wheel with a 7-inch colour TFT display instrument cluster. Other features include 8-way adjustable driver seat, automatic climate control, cruise control, engine start/stop button and reverse parking camera. Powering the Harrier is a 2.0-litre, 4-cylinder diesel engine that produces 138 BHP @ 3,750 rpm and 350 Nm of torque @ 1,750-2,500 rpm. The engine is mated to a 6-speed manual transmission and comes with three driving modes - Eco, City and Sport. The SUV also gets three Terrain Response Modes - Normal, Rough and Wet. Some of the safety features offered on the Harrier include ABS with EBD, rear parking sensors, ESP, 6 airbags, Hill Hold Control, Hill Descent Control, Roll Over Mitigation, Corner Stability Control, Electronic Traction Control, Brake Disc Wiping and ISOFIX child safety seat anchors. The new Harrier is available in five colour options – Calisto Copper, Thermisto Gold, Ariel Silver, Telesto Grey and Orcus White.